“We’re mad as Heaven, and we’re not going to take it anymore!” declares historian Robert McElvaine in this passionate and often hilarious rallying cry for sincere Jesus Followers. He lets the rest of society know that the extreme right wing won’t be allowed to speak for all Christians any longer. His whip-smart, take-no-prisoners polemic lays bare the Christian Right’s “Easy Jesus” creed, in which people who claim to accept Jesus get a free pass to lie in his name. Grand Theft Jesus exposes the televangelists and the leaders of megachurches as the people Jesus warned us about–the wolves in sheep’s clothing of our day. The religion that McElvaine calls ChristianityLite resembles schemes that promise “Lose weight without diet or exercise!” Its leaders say, “Be saved without sacrifice or good works!” Run by a crew of politicians, megachurch preachers, televangelists, hypocrites, and snake-oil salesmen, it has hijacked true Christianity and distorted it into something Jesus wouldn’t recognize. Its leaders have taken the generous and loving ideals of Christ and twisted them into a religion that advocates war and intolerance, values money above charity, preaches hatred instead of brotherhood, and promises “true” believers the keys to the gates of the kingdom of God–and to the bank vault. Jesus’ radical message of love and peace has been drowned out by the bluster, the hate, and the selfishness that often passes for Christianity in America. McElvaine names names in his list of “Leading Lites” who have earned spots on Jesus’ Ten Most Unwanted List and exposes the hypocritical (Ted Haggard), the disgraceful (Pat Robertson), and the shocking (Ann Coulter). Grand Theft Jesus blends outrage and humor in a compelling argument that will help to resurrect the real Jesus, who has been crucified and interred by the “Right Reverends” who recite the Apostles’ Greed, are pro-choice on wars of choice, and preach the Greater Gory of Christ. ROBERT S. McELVAINE is Elizabeth Chisholm Professor of Arts and Letters and chair of the Department of History at Millsaps College in Jackson, Mississippi. He is the author of nine previous books and dozens of articles in such publications as the New York Times, Wall Street Journal, Washington Post, and Newsweek. Visit his website at www.GrandTheftJesus.com. I abuse the priests, indeed, who have so much abused the pure and holy doctrines of their Master. As I noted in passing in the introduction, the reason that ChristianityLite is the most appropriate name for the "religion" of the Jesus Thieves is its similarity to miracle, no-commitment, no-hardship weight-loss plans. ChristianityLite offers a miracle, no-commitment, no-hardship salvation plan. "Be a Christian Without Sacrifice or Good Works" is as enticing as "Lose 50 Pounds Without Diet or Exercise!" And it runs equally counter to common sense. Sin all you want and still be saved! Melt fat away while you sleep! Same great taste; fewer calories; higher intoxication! All the hard parts of the Bible don't apply! Create the image of a slim and successful person! reads the subject line of an e-mail I received while my spam filter was off. The spam that emanates from the pulpits of Lite megachurches and televangelists' studios dangles a similar enticement: create the image of a saved and sincere christian! The image of a Christian is precisely what ChristianityLite is all about--and that's all it's about. As a free-market (at least when it's convenient, about which more later) religion, ChristianityLite employs the techniques of the consumption ethic that has displaced the work ethic in our modern world. Its purveyors sell their brand by making it sound attractive and promising the consumer all sorts of benefits if he or she will buy it. These "Christian conservatives" are neither Christian nor conservative. What they are are people who serve up a con job and call it Christian. They are not conservatives, but con artists. They can con so many people so easily because they are selling what people want to believe. "We associate truth with convenience," John Kenneth Galbraith once noted, "with what most closely accords with self-interest and personal well being or promises best to avoid awkward effort or unwelcome dislocation of life." "JESUS! Fully loaded with all the options you most desire! SALVATION AT UNHEARD-OF ROCK-BOTTOM PRICES! Our greatest sale ever! Nothing down! Rebates! Dealer Incentives! Easy weekly payments! "Friends, this new model 21st-century Easy Jesus is a must-have Savior. Come see us and we'll put you behind the wheel for a test drive! And this is our promise to you: If you can find a better deal on a new Easy Jesus anywhere, we'll match the competitor's price and pay you $100!" "Well, we do talk about sin; but, you see, the issue is: Jesus took care of sin, and Jesus removes guilt from our life. So the emphasis in our church isn't how to get your sins removed, because that's pretty easy to do. Jesus did that on the cross. . . ."
Tom Brokaw interrupted him to say, "You're making it easier for them." Pastor Ted nodded and grinned. "Making it easier for them, just like Jesus did, just like Moses did." While adherents of the fake Christianity that is ChristianityLite pretend that "accepting Jesus as your Lord and Savior" is a difficult thing to do, as Haggard's statement indicates, it ought to be one of the easiest decisions a person could ever make: getting your sins removed is "pretty easy to do." It requires the person to do nothing else--aside from trying to convert others, looking down on those who have not converted and telling them that they are going to hell, condemning abortion, bashing homosexuals, and perhaps abstaining from alcohol (these literalists tell us that the wine Jesus created in his first miracle was really grape juice)--and, of course, the only good work usually called for in ChristianityLite: to donate generously to the church so that the preacher can maintain his distinctly un-Jesus-like lifestyle. And what is the convert promised in exchange for these easy words and deeds? Not only eternal salvation, but riches in the here and now, good fortune, and a Get-Out-of-Jail-Free card that basically says that no matter what you do or how bad it is, you are still a Christian and will be forgiven (unless, of course, your name is Bill Clinton). Hey, get your cost-free Christ! Cost-free Christ here! Hell of a deal. Maybe literally. It is hardly surprising that in a nation where polls show that winning a lottery is the favored way to get rich, a get-saved-quick form of Christianity that promises salvation in return for nothing but saying that you accept Jesus would become so popular. It's all of a piece: Take Fen-phen; buy lottery tickets; accept Jesus. ChristianityLite is a perfectly packaged consumer item, but it's a sham. And it's about 179 degrees from what Jesus taught. Ask not what I can do for Jesus and the principles he taught us; ask, rather, what Jesus can do for ME! Those who pose as biblical literalists but reject most of the things Jesus taught because they're too difficult to live up to are in fact biblical Lite-eralists. Then there is this interesting and revealing quotation from the Reverend Pat Robertson: "The Lord has just blessed him [George W. Bush]. It doesn't make any difference what he does, good or bad." It doesn't make any difference what he does. It doesn't make any difference what any of us does. You can be good or bad in your actions and still be a "good Christian." That, in a nutshell, is the message, the theology--if that word is applicable to such nonsense--of the phony religion that has swept across America and many other parts of the world. I've often heard the same mind-boggling argument. I have slowly come to comprehend the beliefs upon which such attitudes are based. "It was one of the great spiritual marker moments of my life," a man said of his attendance at his first Promise Keepers rally in 1996. "I realized, and the Holy Spirit drove home to me, it wasn't what I did or whether I went to church. It was only through a relationship with Jesus Christ that we're saved." Recently, two of my students wrote independently in their class journals that Christianity differs from Hinduism in that, in the words of one of the students, "Hindus have the concept of karma accumulated during one's life determining his or her fate in the next life. In Christianity, however, people are not sent to Heaven or Hell based on their actions in life but rather [on] their belief in Jesus as the son of the one living God." The other student declared that Hindus "believe in good works, whereas works are not very important in Christianity." It is certainly not my intention to pick on these particular students. Their comments are not at all unusual. They reflect a brand of faith--or, rather, fancy--that anyone living in the South (and, increasingly, elsewhere in the United States and around the world) encounters on a daily basis. It might be called the Doctrine of Justification by Fancy Alone. Xian television programs should be identified in TV listings as "Program type: Fantasy." The "it doesn't make any difference what we do because God is on our side" attitude has broad implications, both personally and politically. When it became obvious that there were no weapons of mass destruction in Iraq, President Bush and other members of his administration "repeatedly said the fact that the principal argument for going to war with Iraq has turned out to be false doesn't matter." It doesn't matter, because, as Falwell said, it doesn't matter what he does, good or bad; God has blessed him. This kind of twaddle is certainly not the religion taught by Jesus. Jesus made crystal clear in numerous comments that what one does, good or bad, does make a difference. Under what passes for Christianity in America today, all you need to do is accept Jesus. As the 2000 Southern Baptist Faith and Message statement puts it: "Salvation involves the redemption of the whole man, and is offered freely to all who accept Jesus Christ as Lord and Savior. . . . There is no salvation apart from personal faith in Jesus Christ as Lord." Here is the fundamental message of the fun-damentalists: Say "Jesus" and then you don't have to do Jesus. In effect, this pseudo-Christianity argues, inverting Attorney General John Mitchell's infamous advice on how to understand the Nixon administration, that God watches what we say, not what we do. But it is Mitchell's actual comment about the Nixon administration that applies to true Christianity: "Watch what we do, not what we say." Those who will, do; those who won't, preach. 6. 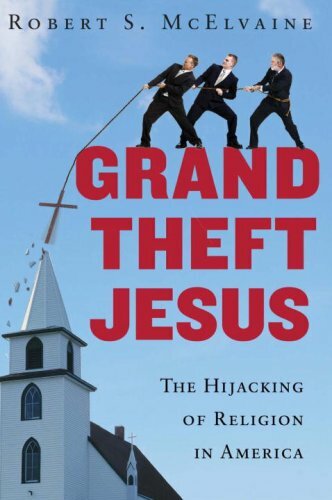 GRAND THEFT JESUS The Hijacking of Religion in America. 9. 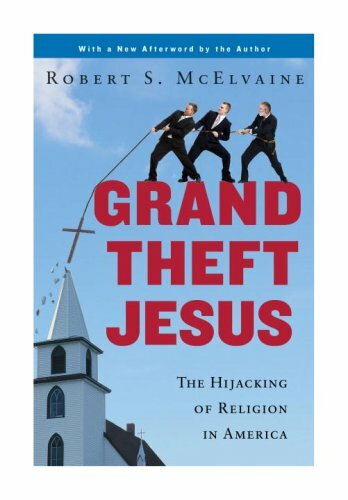 Grand Theft Jesus: The Hijacking of Religion in America McElvaine, Robert S.